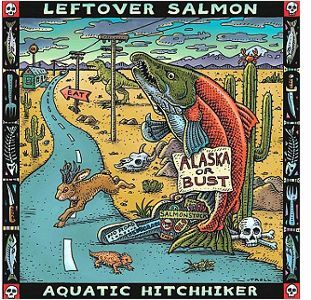 Eight years in the making Leftover Salmon’s Aquatic Hitchhiker finally hit record stores last week. A truly original work of art this album is everything Salmon with absolutely no filler. Comprised of road-tested tracks as well as some new tunes. The impetus for all of can only be the addition of Andy Thorn to the lineup. The last year has seen some changes in Camp Salmon. The departure of Bill McKay and the addition of Thorn have given the band a clearer focus on the “Poly-Ethnic Cajun Slamgrass,” that is their hallmark. The opening tune entitled “Gulf of Mexico” is sung by Drew Emmitt and is reminiscent of his earlier work like “Valley Of The Full Moon.” It refers to the oil spill in the Gulf and shows how Salmon continues to be concerned with bigger issues. Martinez’s drums hit hard like an abandoned alarm clock left to rattle away while Drew’s vocals just soar. Vince gets funky on the road song, “Keep Driving.” You can almost picture him looking out the window of a tour bus with a notepad in hand writing the words down. “Liza” is one of my favorites that has made it into their new rotation; it’s a fun shanty love song that makes crowds bounce. Musically the title track “Aquatic Hitchhiker” is perhaps the most profound on the album, lead by Thorn’s banjo shredding and Drew’s violin. For several years after the passing of Mark Vann and the exodus of Noam Pikelny LoS seemed to be searching for someone to fill the void. I can honestly say that they have found the plug in Andy Thorn. The banjo is so essential to their sound that it is imperative to have a finger-flying shredder at the helm. Andy is just that. “Bayou Town” as it’s name insinuates is a down home zydeco-flavored strum. Greg Garrison’s bass finally finds the spotlight on “Sing Up to the Moon,” with Vince on vocals. In “Light Behind the Rain” Thorn steps up the microphone, it’s a track that he used to perform with Grant Farm. His smooth delivery is the perfect juxtaposition to Vince’s rowdiness and Emmitt’s towering voice. Leftover kicks back into high gear with the extra optimistic “Stop All Your Worrying.” Martinez gets out the brushes to Great American Taxiesque “Walking Shoes.” The Americana that Herman has been focusing on for several years certainly made it into the mix with this song. “Kentucky Skies” is a Scruggs flavored romp into the Salmon’s more traditional sound. “Gone For Long” feels like the days last cigarette while the album closing “Here Comes The Night” gets jazzy and a little lounge. The mix of Aquatic Hitchhiker is just stellar. Recorded in both Colorado and Portland, it has a solid flow, both in music and texture. I highly recommend grabbing a copy, sitting down with a cold beer, and letting the night come.